A day at a spa or salon is like a spiritual experience for many women. It's a time to be pampered, to be the centre of your own attention and to do something just for you. But when you're nearing the end of your pay cycle and those purse strings are getting tighter, it's tempting to scrimp on the salon and settle for a bit of DIY. Infomercials for at-home electrolysis machines, pain-free waxing kits and gel nail polish sets would have us believe we never have to step foot into an expensive salon again. So what can we get away with doing ourselves and when is it best to just fork over the cash? If you can get over the feeling of hot rubber bands being flicked over your bikini line, electrolysis is one of the most effective methods of permanent hair removal available today. While this started out as very expensive salon-only treatment, lately there have been more and more ads for hand-held devices made for personal use popping up on our TV screens. Sue Ismiel, creator of hair removal empire Nad's, is a huge advocate for DIY waxing, but warns against the use of personal laser hair removal machines. "Laser hair removal is a very safe technique as long as you are treated by a qualified therapist and reputable clinic," says Ismiel. "Hand-held devices for at-home use do not generate the power that a clinical laser device generates and are not as effective as true medical grade lasers." Many women (and men for that matter) find the process of hair removal an embarrassing one and balk at the thought of a stranger getting right up in their nooks and crannies. So for many, at-home waxing is a welcome alternative. Areas like the legs, upper lip and underarms are fairly easy to navigate yourself but Sue Ismiel insists "some areas such as the bikini/brazilian area will need more practise and at times some assistance." With a huge variety of at-home products available today such as cold gels, warm wax pots and ready-to-use face and body wax strips this is definitely a consumer-friendly option that can yield great results. "Waxing removes hair directly from the root, so hair removed by this method takes up to eight weeks to grow back," says Ismiel. "Waxing does make the hair grow back finer and sparser, leaving your skin looking and feeling smoother." With Clarisonic brush technology allowing us to clean deeper into our pores than ever before, achieving clear skin at home has never been easier. If you've got a naturally healthy complexion and no real skin concerns, slathering on a mask suited to your skin type, exfoliating twice a week and following a daily cleansing, toning and moisturising regime may be all you need to keep your skin in top condition. However, if you suffer from conditions such as acne, rosacea, severe dry skin or pigmentation, seeking the advice and care of a professional beauty therapist is worthwhile. A therapist is able to assess your skin, recommend products suited to you and give you a nourishing treatment that won't aggravate existing issues. But if you're in it purely for the pamper-factor, nothing beats the smell of essential oils and the feeling of total relaxation that comes from a blissful, hour-long facial. 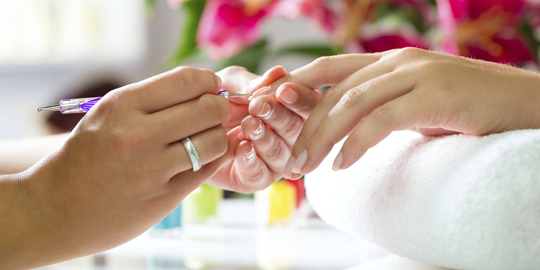 For special occasions or complex, intricate artwork, visiting a nail salon is an absolute must. Ever tried drawing detailed patterns on your nails with your left hand? The results aren't pretty. But if you're someone who likes to change their nail colour as much as their clothes then it pays to become a dab hand at DIY. Invest in good quality top and base coats, a cuticle remover, nail clippers, a long-lasting glass emery board and a nourishing cuticle oil and you're set. The same equipment can be used for pedicures too, just add a foot file for removing dry, dead skin and a foot cream or heel balm to keep skin soft. With easy-to use formulas and a rainbow of hues available at your pharmacy and supermarket to suit all hair types, refreshing your hair colour at home has become a fairly simple task. Grant Withnell, technical director for Schwarzkopf, says, "ideally it's best to colour your hair within two shades of your natural colour," when doing it yourself. "For example if you are light brown and would like to go dark blonde, or dark blonde to medium brown, this is easily achieved at home. But never ever put colour on colour - you'll just make your hair darker." Even if you're a seasoned pro at DIY dye, Grant stresses the importance of reading instructions as well as performing a strand test first so you can see exactly what sort of colour you're going to end up with. "Everyone's hair is uniquely different, so the colour turns out different according to various factors such as hair texture and condition." At home colouring is supposed to be easy, so if you're wanting a dramatic new look or you think it's too challenging, seek expert advice.